An interesting and unusual dark russet apple from Ireland with an intense sweet flavour. Allen's Everlasting is an old variety originating from Ireland. First recorded by Thomas Rivers in 1864. Received a First Class Certificate from the RHS in 1899. 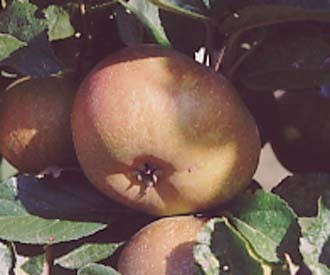 Medium sized, flat to flat-round fruit. Ribbed and often irregular in shape. Olive green skin covered with a heavy dark russet and a coppery red flush. Tough skin and best eaten pealed. Firm, quite dry flesh. Strong sweet sharp flavour. Hangs well on the tree and should be left as long as possible to ripen. Keeps very well.